Need one-on-one In-Office surgical case assistance? Have a difficult case you would like to predictably treat in your office? 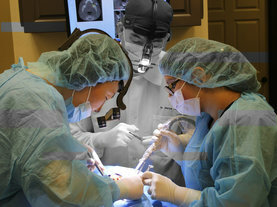 Personalized LIVE patient implant training where YOU place the implants in the comfort & familiarity of you own office. This custom program is the next step from theory, LIVE surgical course training, to now placing implants or tackling your advanced cases with confidence in your own office setting. Emphasis is placed on doctor's performing LIVE patient implant surgeries on their patients right in their own office one-on-one under the guidance of one of our Master implantologists. Learn procedures ranging in techniques and surgical complexity, while earning AGD CE hours, and increasing revenue by keeping complex cases in-house. to do our in-office surgical case assistance. 1. One-on-one In-Office surgical case assistance and "Real World" surgical training that allows you to place implants with confidence in complex to advanced cases. 2. Increase patient treatment options while increasing practice revenue by keeping safe predictable, yet complex implant cases, in house. 3. Learn to tackle "Real World" complex cases, while retaining revenue, such as multiple implants, advanced bone or soft tissue grafting, full arch "All-On-X" or angled implant therapy with immediate load full arch prosthesis, L-PRF/i-PRF, Sinus lifts and more... right in your own office! 4. This program maximizes your return on investment, as we assist you to simultaneously train your assistants to become amazing surgical auxiliaries. 5. Once registered all communication, surgical planning, CDT coding & patient treatment plan, supply ordering, and CBCT review, is all included. 6. Continuous communication post surgery, assistance with case management, complications, and followup are included. Our master clinicians are here to help.